This tutorial was written by Jenny on 4-1-2009. Resemblance to any other tutorial is purely coincidental and unintentional. I am using the artwork of Lacy Clagg. You need a license to use her artwork. I am licensed to this image through LCTS. You can now purchase her tubes at Creative Design Outlet. Using paper of choice apply the mask layer. Copy and paste frame 2 as a new layer, resize by 85%. Copy and paste paper of choice as a new layer, place under frame, remove any excess paper sticking out from the frame. Add subtle drop shadow to the frame. Copy and paste doodle of choice as a new layer, resize if needed,add drop shadow, place below paper layer and to the right of the frame,duplicate,image,mirror. Copy and paste Easter Bunny of choice as a new layer, resize to around 50%,add drop shadow and place inside the frame. Copy and paste Easter basket as a new layer,resize to 50% and again if needed, add drop shadow and place above frame and to the right. Copy and paste butterfly of choice as a new layer, resize 50% twice,add drop shadow and place to your liking. 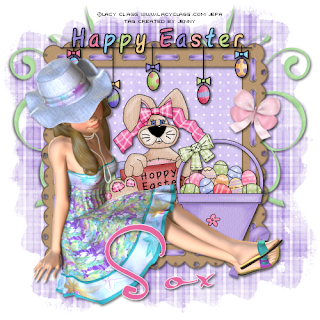 Copy and paste Easter Banner as a new layer, place atop frame, resize if needed, add drop shadow. Copy and paste tube of choice, resize if needed, add drop shadow and place to your liking. Resize the tag if you so wish. Add copyright info and text and you are done!